It’s that time again, another Halloween themed pattern. Actually, there’s kinda 2 patterns here, depending upon how you look at it because you’re getting the pattern for the hat and the spiderweb (there’s a how to on earrings below as well), which I made some awesome earrings out of years ago and still get consistent compliments on. The reason I chose to include a pattern like this is because I so seldom dress up for Halloween but I do like having an option, so to speak, that makes me look in the spirit of things when I pass out candy at home. Last year I did a red top hat, based on the RH pattern but I adjusted it, this year I tried to create my own design. I’m calling it the Winifred Hat, because of all the witches working she’s the worst. Bad joke? Nah, who doesn’t still love Hocus Pocus? It’s too bad that movie was made in the time of few sequels, because we’d be on our 5th Hocus Pocus and perhaps a couple of them would have been fun (either so bad they’re good (kinda like the original) or just actually as good as the original). Ah! I got off on a tangent. Do not get me started on 90’s Disney movies, that was my childhood and they are still in my head. You can purchase an ad-free downloadable pdf for this pattern in my Ravelry shop for $1.50. This hat is super easy to customize. On the top just continue the increase and then sc around, like what I’ve written here, to make the hat larger. Same thing for the brim, just do two rows of increases and then sc around to make that larger too. Color A is black and Color B is orange. The hat is worked in the round with a slip st into the first st of the row. The bow is only 4 rows, you can make this larger by making more chs on the ch row before row 1 starts, or add more rows. It does not matter how many chs/ sts or rows you do here. The bow is worked in the round, with a slip st into the first st to the row. The first row of the spider web is worked in the round with a slip st into the first st of the row to secure. The from the second row on, you work continuous rows around, without a slip st until the last row. You can make the web out of yarn rather than thread, but it’ll be larger. You can make your own earrings as I have on in the photo by reading below in the spiderweb section. You need to know how to work into the front loop only of a stitch. I wear this hat off center on my head, held there by bobby pins. *Note: Be sure to secure your magic circle now because once the cone gets larger, it will be difficult. Fasten off with both colors. Weave in your ends. Ch 20, slip st to form a ring. Fasten off leaving a super long tail, use this tail to wrap around the center of the bow and then secure your bow to the hat, right above the brim. Then spread your web out flat and stiffen it with fabric stiffener, then let it dry. 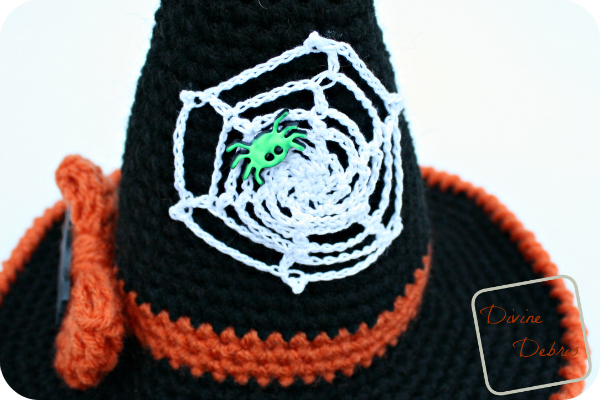 Glue a spider or draw a spider with puffy paint and tada! Attach a jump ring or two and a hook and you’ve got earrings! Attach the bow around the bottom of the cone, where you created the strip of Color B. I glued a cute spider button on the front for fun, you don’t have to. 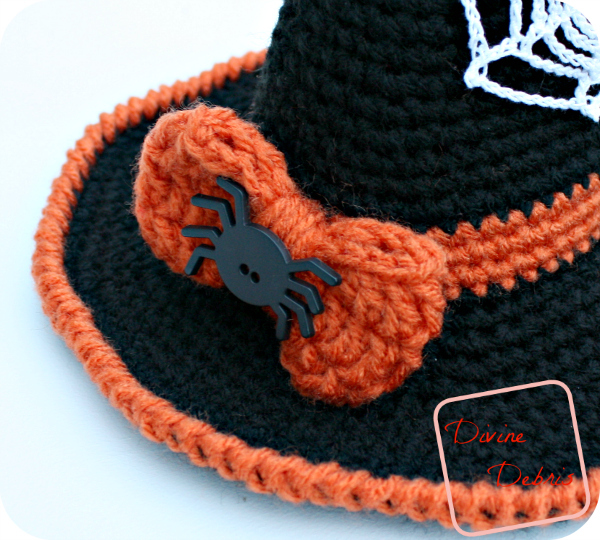 Use whatever glue you have on hand, just make sure it drys clear so it doesn’t make yuck marks on your hat, and glue the spiderweb to the cone of the hat. I did this one picot at a time, stretching it out a bit as I went. The web is tight, or can be, yours might be loose. After the spiderweb is secure, glue another button on top of the web. I painted the button with puffy paint. You can also just draw a fun spider on with puffy paint. All the possibilities are yours! So, I hope you love this pattern as much as I do. I cannot wait to wear this. Ha! I might even wear it before Halloween. starts. Take care of yourselves! Don’t forget to check the MMM Blog Hop post for a coupon code and sign up on the left there to receive updates when new posts are posted! And my latest paid design is out, a new one in the Josephine Line, the Josephine Shawl, which you can get for $1.99 through October 20th! I loved designing this pattern, especially because I used Knit Picks Palette and it’s a wonderful yarn. This pattern is linked up to the Linky Ladies Community Link Party #21 and Rebeckah’s Treasures’ Saturday Link Party #17.
to cute! 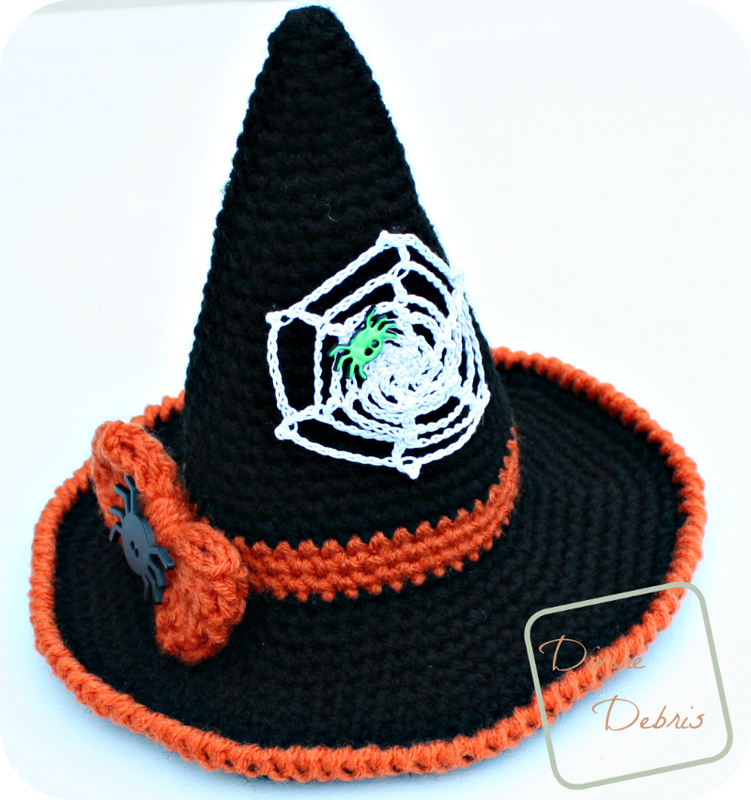 love the Witches hat and the spiderweb just makes it awesome! How do l make this has bigger for a baby and 9yr old? You would have to keep increasing the cone portion until it’s the desired height and then sc around the end, for the brim, as I did here but it would be larger. You’d have to increase there as well until you were happy. 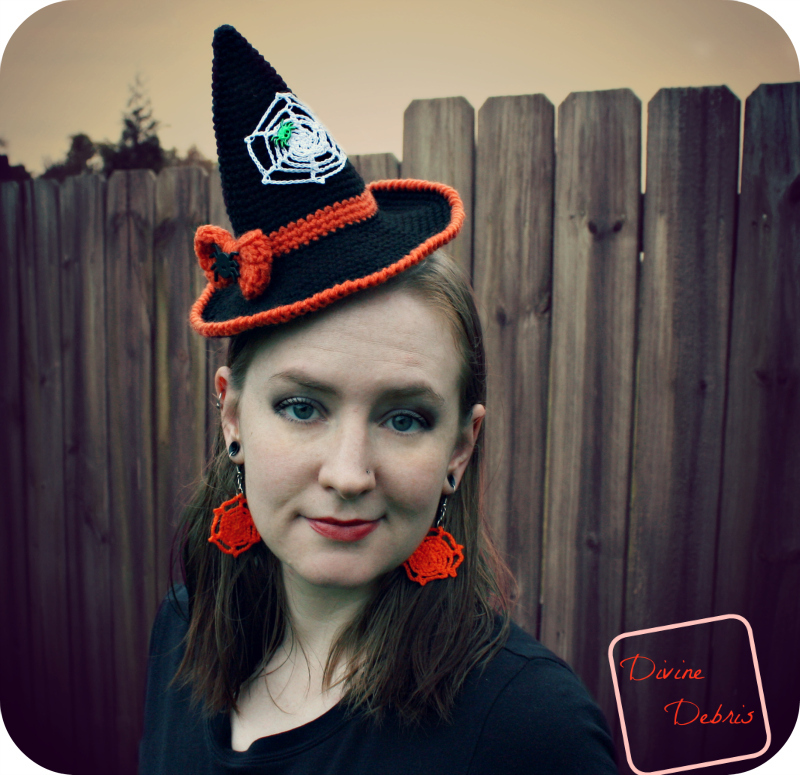 I love “Hocus Pocus” and I LOVE this hat! !